The Colosseum in Rome is one of the most magnificent ancient structures. This most imposing and biggest Flavius amphitheater in the Roman world was built by Emperor Vespasian of the Flavia family and opened by his son Titus in 80 A.D.
Rome, one of the most beautiful cities on Planet Earth, is visited by millions of tourists from across the world every year. This ancient, historic city, which was the seat of the mighty Roman Empire, is a must-visit destination on the itinerary of most tourists visiting Europe. 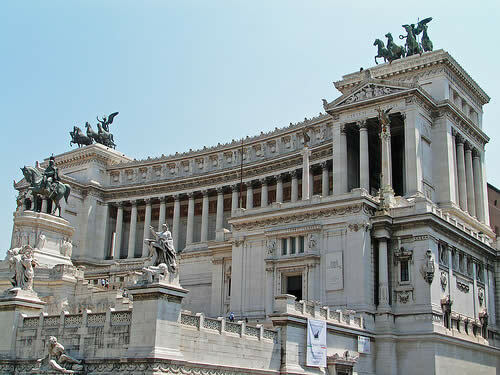 The fabled treasures and masterpieces of Roman art and architecture continue to attract hordes of tourists to Rome. One such notable piece of architecture is the Colosseum, which is worth visiting whenever you visit this fantastic city. Be prepared to spend an entire day visiting this historic ruin of ancient Rome. The “Colosseum” or “Coliseum”, built by Emperor Vespasian of the Flavia family and opened by his son Titus in 80 A.D., is the most famous monument in Rome. It is the most imposing and biggest Flavius amphitheater in the Roman world. The opening ceremony was highly ostentatious and lasted for 100 days. People regaled themselves with great fights, shows and hunts, which involved the killing of some 5,000 animals. The opening also saw the reenacting of the great battles of the past. Real sea battles ‘Naumachias’ were reenacted. To hold this one of the most fantastic events in Roman times, the arena space was filled with water. The Colosseum is one of the most magnificent ancient structures. This all-white monument is fully covered in splendid travertine stone slabs. This structure is elliptic in shape so that it could accommodate more spectators. The structure had four floors. There were 80 arches each of the first three floors, while on the second and third floors the arches were decorated with huge statues. Today not much remains of what used to be the greatest arena in the ancient world. The Colosseum nowadays reflects just like a skeleton of its majestic past with three-fifths of the outer surrounding brick walls missing. When the Colosseum was no longer in use, the Popes during the Middle Ages converted it into an enormous iron, lead and a marble quarry for building the Barberini Palace, Piazza Venezia, and also St. Peter’s. The holes can still be seen in many columns of the Colosseum. The Romans made the holes for extracting the iron and lead for the nails inside the marble blocks. The amphitheater in the Colosseum had a capacity to accommodate up to 70,000 spectators. The tiers of seats were inclined such that wherever the people say they were able to get a perfect view. All Roman citizens had free access to the amphitheater. However, the places were demarcated according to the social status. The common people were seated at the top, with separate sections for men and women. The emperor, senators, vestals and priests being superior in status had their seats reserved in the front row. The Colosseum offered the opportunity to create a link between the leaders and citizens through common participation at important public events. The Colosseum still continues to be one of the greatest marvels in Rome and the entire world, and attracts millions of visitors every year from around the globe. The Colosseum was our favorite landmark in Rome. It's amazing, but if you want to wait 4-6 hours in line then try getting in without a tour guide. The guides are good and give you a great historic walk through. We have visited the Colosseum on previous visits to Rome before us west coast bus tours and it is a truly awesome sight. We didn't go inside this time due to very limited time, but we walked around the outside which was nice.